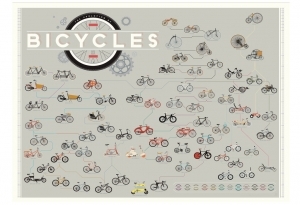 THE EVOLUTION OF BICYCLES $29, 24" x 18"
With over 75 intricately detailed illustrations we've traced the evolutionary tree of the bicycle from 1780 to the present day. From the early high-wheel "boneshakers" of the Victorian Era to the first racing bikes to the more recent evolution of mountain bikes and BMX rides, each bike on the chart is categorized by utility and represents new innovations in a given bicycle genre over time. What results is a super-alloyed admixture of evolution, genealogy, famous models, and a catalogue of forms--a truly be-spoke rendering of two-wheeled transportation.